Jabari Parker was the first freshman ever to start at Simeon Career Academy in Chicago, where he became only the second player in the history of Illinois high school basketball to start on four state championship teams. A 6' 8", 235-pound forward, he was a top recruit in the class of 2013, embarking on what seemed likely to be a one-year college career. Still, Parker's freshman season at Duke has been full of adjustments, all of which have served to deepen his connection to his coach. 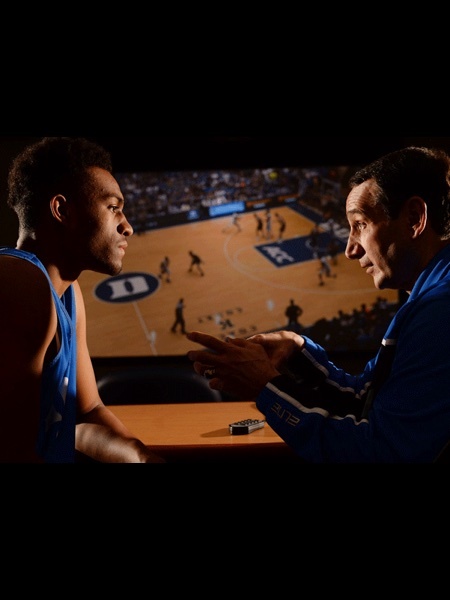 Mike Krzyzewski wore a dark-blue suit and tie when he approached the front door of Jabari Parker's South Side home at 7 p.m. In less than 48 hours Parker would reveal his college choice on national TV. Duke was the front-runner. Coach K had come to close the deal. Parker waited in his bedroom. A shoebox in his closet contained a half-dozen handwritten letters that Krzyzewski had sent to him over the previous 18 months. But recently Parker had begun to think seriously about Michigan State. His father, Sonny, a former NBA swingman, had kidney failure and was on dialysis three times a week. Durham, N.C., is nearly 800 miles from Chicago; East Lansing, Mich., is just over a three-hour drive. Jabari was poised to forgo his top choice to make it easier for his father to see him play. As Krzyzewski knocked, he had no idea what was going on in Jabari's head. But he recalled the advice Jabari's mother, Lola, had imparted before the visit: "Jabari needs to know how you are going to play him and what goals you want to set." CBS This Morning: Jabari Parker "a treasure to the game"
Sonny led Krzyzewski to the family room, where Lola and Jabari joined them. Before turning the floor over to Coach K, Sonny set the tone. "Distance doesn't matter," he said. "We can fly to Durham." His comment was directed at Krzyzewski, but it was intended for Jabari. The coach took it from there, trading on what he had learned from working with the top players in the world as coach of the U.S. Olympic team. "The great ones -- Durant, LeBron, Kobe, Carmelo -- don't have positions," Krzyzewski said. Jabari nodded. "You're a great player. And at Duke you will be a player without a position." Then Krzyzewski offered an analogy: "If you put a plant in a pot, it might take the shape of the pot. But if you put a great plant in great soil and let it go, some crazy good things can happen. If I put you in a box and call you a two or a three, that would be a pretty good box. But if I give you the freedom to play multiple areas, there wouldn't be a box. You would be growing up everywhere." Two hours later, as the meeting wound down, Krzyzewski shared his goals for Parker as a Blue Devil: National player of the year. A national championship. First pick in the NBA draft. Sonny raised his eyebrows. Lola gulped. "Are you ready for the challenge?" Krzyzewski asked. A backpack full of textbooks over his shoulder, Parker cut across campus on the first day of summer classes. After taking in his new surroundings -- perfectly- manicured flower gardens, leafy trees, gothic arches, mammoth stone buildings -- Parker entered the Blue Devils' practice facility with some trepidation. The 66-year-old Krzyzewski had been blunt about Parker's training and preparation for the upcoming season. "We have to get rid of who you are right now," Krzyzewski said. "Let's build on who you were. You were the best young basketball player in the world before the injury." In June 2012, Parker broke his right foot and was sidelined for five months. When he returned to the court he spent more time in the low post. "You lost some of your athleticism and fluidity," Krzyzewski told him, "so you have played in a compensatory kind of way. You have to remember the athlete you were. The fact that you faced the basket. The fact that you made multiple moves. And you could play all over the court." "But you have to be in condition," Krzyzewski said. "I'll push you with my staff because everybody needs to be pushed." All Blue Devils freshmen receive a comprehensive physical. But trainer Jose Fonseca was surprised when he reviewed a parental questionnaire, which indicated that Parker had worn glasses as a child and been fitted for contact lenses as a teenager. An eye exam confirmed that Parker is nearsighted; in fact, he had trouble seeing clearly from one end of the court to the other but refused to wear glasses. "I was already self-conscious about my height," he says. "I didn't want kids calling me Four Eyes too." So he taught himself to play and shoot despite the impairment. Krzyzewski insisted Parker wear contacts -- one small step in the larger adjustment to college life. At Duke, Parker found that the people were unusually nice. Twice during summer school he lost his wallet; each time it was returned to the basketball office with everything in it. "That wouldn't happen back home," Parker said. "My wallet would have been long gone." At the end of summer Parker had a week off before the start of fall classes. He stopped by Krzyzewski's office to say goodbye before flying back to Chicago. "Watch your wallet," Krzyzewski said. Parker smiled. "I got you, Coach." Three days later Krzyzewski called Parker at home. "Do you still have your wallet?" he asked. Parker laughed. "Yeah, I still have my wallet." But Krzyzewski wasn't just joking. "Being from the city is a great strength," he told Parker. "You've developed some edges in order to be who you are. You are in a different environment now at Duke. Just make sure you are still that city kid. We don't want to smooth those edges out. We want you to have them and remember them." Maurice Wallace is a Duke English professor specializing in African and African-American studies. A Blue Devils supporter, he was pleasantly surprised when Parker signed up for his class Wake Up! : The Films of Spike Lee. For the first few weeks Parker didn't say much. But he arrived early and routinely sat forward, with his elbow on the desk, his chin resting on his hand. "I could tell by his manner that he was thinking and engaged," Wallace says. Parker had a 3.7 GPA at Simeon. Determined to keep his grades up, he chooses not to date or go to parties. Movies are his main escape, whether downloading half a dozen each week or going to the theater with his roommate, freshman guard Matt Jones. On the team Parker is the biggest joker and the worst dresser. One day Jones was in stitches when Parker emerged from his bedroom wearing rainbow sneakers, bright yellow pants, a North Korea jersey and a big grin. "Jabari has a terrific sense of humor," Krzyzewski says. "And he doesn't have any demons. He doesn't drink or party or have a problem with authority. Those things rob you of your love of preparation for the game." In his class Wallace showed a series of Lee films, including 4 Little Girls, Do the Right Thing and When the Levees Broke. Parker was an enthusiastic participant when the class discussed Malcolm X. "I spoke about African-Americans' long association with Christianity and the peaceful teachings of Jesus Christ," Parker says. "And that when Malcolm X emerged, Islam was relatively new to a lot of people in our country, including African-Americans." Wallace was impressed, saying, "There was something about the way Jabari spoke that gave me a greater sense of who he was as a young man of faith. I knew then that his background and his rearing in faith was significant. And he owned it. I have deep admiration for that." Jabari is a member of the Church of Jesus Christ of Latter-day Saints, having attended Mormon services with his family since birth. Shortly after arriving at Duke, Parker got a phone call from Hall of Fame quarterback Steve Young, the most visible Mormon athlete in the world. "You can be a fierce competitor and you can be in it to win as long as your source material is Christ," Young told him. "That's what keeps you humble. It's what I call spiritual athleticism." After that, Parker began carrying one of Young's football cards in his wallet to remind him that he wasn't alone. An assistant texted Parker that the coach wanted to see him in the theater where the team studies film. He entered and found Krzyzewski sitting high above him in the top row. "Come in and have a seat," Krzyzewski said. "You think you're in trouble, don't you?" "This ain't one of those meetings." Sitting side by side, they watched video of a scrimmage. Krzyzewski hit pause. "Look at your feet," he said. "They are in the wrong position." Parker nodded. Krzyzewski stood and demonstrated the correct stance. Moments later Krzyzewski stopped the tape again. "Look at your hands," he said. "They are not ready." "I gotta change that," Parker said. On the next sequence Coach K zeroed in on Parker's hips. They were turned in the wrong direction. "This is about precision and doing physical things to create better habits," Krzyzewski said. "It's what the guys I coach in the summer do. Kobe and LeBron and Durant are precise." After an hour Krzyzewski turned off the film. "I never realized I looked that bad," Parker said. Krzyzewski leaned in closer and looked into Parker's eyes. "It's not personal," he told him. "It's the truth." Parker left the theater energized. "In high school I used to watch highlights of myself in my living room," Parker says. "I basically focused on my scoring. Watching film with Coach is very different. It's intense. I came to Duke for experiences like this." Krzyzewski wanted Parker and the other starters to meet him in the theater before practice at 1:45. He screened a clip of Parker from a recent scrimmage. "Let's follow you when you don't have the ball," Krzyzewski told Parker. The first sequence showed Parker standing just off the right block. Coach K stopped the tape when Parker's defender turned his head to look at the ballhandler, who was on the opposite side of the court. "What if you cracked in on the guy in the low post?" Krzyzewski said. "Would you score?" "Well, you can do that. It's not a set play for you. But he's not looking." Over the next few minutes he showed Parker multiple ways to maneuver without the ball into open spaces, encouraging him to make reads and let his instincts take over. Parker nodded. "If you learn to do this," Krzyzewski said, "I think you become somewhat unguardable." On the next film sequence Parker drew two defenders after catching an entry pass in the high post. "You could be a great passer out of that," Krzyzewski told him, pointing to teammate Rodney Hood, left alone beyond the three-point line. "I see it," Parker said. Later that afternoon, Krzyzewski called a play that put Parker in the high post. It was a test. Parker caught the entry pass. He was immediately double-teamed, freeing up Hood beyond the arc. Without hesitation, Parker kicked the ball to Hood, who knocked down a three. Krzyzewski stopped practice and walked up to Parker at center court. "What were we talking about in the theater?" "I got it, Coach," Parker said. "How did you like that?" "Learn to like it a lot. That's what you are going to do." The hype had reached Final Four proportions for the Champions Classic at the United Center: top-ranked Kentucky versus No. 2 Michigan State, followed by fourth-ranked Duke versus No. 5 Kansas. Hundreds of journalists and NBA scouts. Tickets for $1,000. And the matchup that everyone wanted to see: Parker, in his return home, against Jayhawks freshman Andrew Wiggins. From the opening tip Parker looked like a kid on a Chicago playground. He drained four threes. He went coast-to-coast, blowing past defenders, switching hands on the dribble and finishing with a righthanded layup. Few of his baskets came off set plays. "His knowledge of the game when he doesn't have the ball has increased a lot," Krzyzewski said after the game. "He's recognizing a lot of places on the court where he can go where people cannot predict what he will do." Parker poured in a game-high 27 points, fouling out with a minute remaining while trying to deny a breakaway dunk by Wiggins, who had 22 in the 94-83 Kansas win. An hour after the game Lola stood inside the United Center with other parents and friends of players on the Kansas and Duke teams. Eventually Parker and Wiggins reentered the arena together. Wearing hoodies and backpacks, the nation's two most scrutinized players looked like innocent teenagers in need of some love. Jabari put his arms around his mother and whispered in her ear, "I love you." Five minutes later he was headed for Duke's bus. One of Lola's friends said, "It doesn't seem fair that you only got to see him for a minute." "It's enough," she said. "It's enough." A life-sized image of Parker was hanging outside Madison Square Garden for the Carquest Auto Parts Classic. Yet on the Garden floor he seemed at home, attacking the UCLA defense tirelessly. In 37 minutes he scored 23 points and grabbed 10 rebounds. The Blue Devils won 80-63, lifting their record to 9-2. In every way Parker played like a No. 1 pick. He sounded like one too. Sitting on a stool facing dozens of handheld recorders and television cameras, Parker looked relaxed afterward. "Jabari, 45 scouts are here," one reporter said. "Bruce Springsteen is in the stands. You're in front of a packed house in New York. How do you keep that all in stride?" "Well, I didn't pay attention," he said. "To tell you the truth, I don't care about the scouts. I'm focused on our team and what we want to accomplish." "Are you familiar with any of Bruce Springsteen's music?" "Ah, no," he said, smiling. "That's ahead of my time." Outside the Garden hundreds of fans leaned up against barricades near the Duke team bus, chanting Parker! Parker! Parker! But Jabari bypassed the autograph seekers to spend time with a fifth-grader whom Lola had spotted near the barricades. Parker hoisted the boy up and posed for pictures with him. That night, Krzyzewski got an unexpected call. His only brother, William, a retired Chicago fire department captain, had died of cardiac arrest at 71. Krzyzewski wept. William had successfully undergone surgery for throat cancer before Christmas, which had been cause for celebration and prayers of gratitude. He was in recovery. But complications developed after the operation, and suddenly he was gone. Krzyzewski caught the first plane to Chicago. He flew back to Durham for the Eastern Michigan game on Dec. 28. During the national anthem his eyes welled up. As the game went on he said little to the officials and barely spoke to his players. Duke won easily, 82-59, but Krzyzewski's mind was elsewhere. On Jan. 3 he attended William's funeral in Chicago. Then he left for South Bend, where Duke would face Notre Dame the following day to kick off the ACC schedule. Krzyzewski hadn't slept in days. His heart was with his brother, not his team. Something was wrong with Parker, too. Against the Irish he scored seven points on 2-of-10 shooting and grabbed just four rebounds. It was the first time all season he hadn't reached double figures, and the Devils lost 79-77. After Krzyzewski watched film of the game with the team, he pulled Parker aside. "Were you there?" Krzyzewski said. "I wasn't there," Parker said. "I didn't think so," Krzyzewski said. A couple of nights later Parker persuaded his roommate, Jones, and forward Amile Jefferson to go see The Secret Life of Walter Mitty. Parker liked it more than any film he had seen in 2013. "I relate to Mitty in a number of ways," Parker said. "In my mind I go places sometimes. I particularly liked the scene where Ben Stiller is long-boarding down a steep highway to escape a volcano." Parker was realizing that his freshman year at Duke -- in all likelihood his only year at Duke -- was half over. Back in Chicago during the holiday break, friends talked to him about being picked No. 1, which is where he appeared on most draft boards. "They are rushing the process," he said. "I don't want my teammates to think I'm selfish or that they don't have my full commitment. I enjoy being a Duke player. Playing here was one of my dreams." Three nights later Parker disappeared again in a 79-57 win over Georgia Tech. He took just 12 shots and finished with 12 points. On Jan. 11 he had 15 points and seven rebounds against Clemson -- a solid performance for most players, but not Parker. The Tigers romped 72-59, dropping the Blue Devils to 1-2 in the ACC and nearly knocking them out of the Top 25. After the Clemson loss Krzyzewski didn't want to see or talk to anybody for 36 hours. He slept soundly for the first time in two weeks. The rest didn't dispel Krzyzewski's grief -- his players and staff watched him sob, uncertain what to do -- but having a refreshed mind helped him understand what was happening. He had lost his edge. "The thing that separated me as a coach is I have a real anger, passion and emotion that I can get anytime," Krzyzewski said, snapping his fingers for emphasis. "I have incorporated my passion with knowledge and good players. It's been a good recipe. "At this level you must always have an edge," he continued. "To maintain it takes a huge commitment. And then you get your world rocked by something. Losing my brother rocked my world." But William's death also put Krzyzewski in a position to lead the Blue Devils with humility. "Overall this will be a great experience for them because they see someone who in their minds is very powerful and who can't be penetrated," Krzyzewski said. "And they see me being penetrated to where I'm moved to tears." Three minutes before the Blue Devils faced Virginia, Krzyzewski entered Cameron ready for a fight. He greeted each of his players with a cold stare and a fist bump. He began barking at officials minutes after tip-off. He snarled at players who failed to execute. And when Jefferson dived on the floor for a loose ball, Coach K turned to the crowd, balled up his fist and thrust his arm in the air, screaming, "C'mon!" By the end, Krzyzewski was hoarse and Duke had played its most spirited game of the season. It took breakout performances by Jefferson and Rasheed Sulaimon to squeak out a 69-65 victory. But Parker was on the bench when Duke fought off the Cavaliers' late run. It was his worst performance to date. In 26 minutes he scored just eight points on 3-of-11 shooting. He had three rebounds and took no free throws. In the locker room Parker had a new experience: no cameras, no recorders, no questions at his locker. The media rushed to interview Jefferson and Sulaimon. Lola watched the Virginia game on TV. It looked to her as if the goals Krzyzewski had set with Jabari during his recruiting visit -- top pick, player of the year -- were being neglected. Had Coach K stopped pushing her son? Frustrated, she sent a stern text message to assistant Jon Scheyer. She said she was flying to Durham for the North Carolina State game on Jan. 18 and wanted a private meeting with Krzyzewski afterward. Unable to sleep after the game -- and unaware of Lola's text -- Krzyzewski studied film. The more he watched, the more he wondered what was wrong with Parker. I'm not doing the job with him, he told himself. For his talent he's not a real good player right now. At 4 a.m., Krzyzewski saw something. With Duke leading 56-43, Parker caught the ball 12 feet out on the baseline with a clear path to the hoop. Before Christmas, Parker would have taken one dribble and dunked. But in this sequence he hesitated, giving a smaller defender time to cut off his path to the basket. "If he drives, he's going to get two or three points," Krzyzewski thought. "The only way this guy can guard him is if Jabari takes a jump shot." Parker took one, and missed. He's concerned about being too good. "I knew that before he got here," Krzyzewski said. "At Simeon he played with a self-imposed regulator based on human conditions. He didn't want his teammates to be jealous of him." Coach K knew his theory was correct a few plays later when Sulaimon made a big shot and Parker was on the bench. Instead of sulking, Parker was cheering. It was the only time he had been animated all night. It was nearly dawn, but Krzyzewski knew what to do. At 10:15 a.m., Parker arrived at Cameron for a photo shoot with his coach. The photographer instructed the two of them to face each other and pretend to have a friendly conversation. "I think you love it here so much that you want to be good, but not too good, so you won't be in the discussion." "You'll be in the discussion anyway because the NBA draft is on potential." "I'm a little bit angry with you because while I have you, I want you to become as good as you can be. And I don't think you're giving me all that you can give me. Agreed?" "I've been exposed to great players," Krzyzewski said. "Great players are different. And you're different. I think you're finding out more things about yourself. It's exciting. You love it. And you're worried that if you are so good, you're going to give that up." "Jabari, you don't have to leave," Krzyzewski said. "I'm not trying to talk you into anything. What I'd like for you to do is just be good. And when the time comes, you make a conscious decision. And maybe by April you'll know that you've had enough. Duke was great. I can move on." That afternoon, after Parker entered the locker room, he reached into his wallet and removed his Steve Young football card. He affixed it to the inside of his locker with athletic tape. If there was anyone who knew the feeling of great expectations, it was the quarterback who replaced Joe Montana. Parker cut his hair so that it looked more like it had at the beginning of the season, and against N.C. State he played as he had at the start of the year as well. With his mother sitting behind Duke's bench, Parker drove the lane against 7' 1" Jordan Vandenberg the first time he touched the ball. He missed. But he got the ball back on Duke's second possession and did it again, this time drawing a foul. Other than one jumper, Parker relentlessly pounded the ball inside. By halftime he had taken 10 free throws -- more than in the previous three games combined. Parker continued to dominate in the second half, finishing with 23 points and seven rebounds. Duke rolled, 95-60. The pack of reporters returned to his locker. Next door, Lola waited outside Krzyzewski's office. His staff warned him that she might be upset. But the game had erased her frustrations. He opened the door and put his arms around her. "Sonny and I appreciate everything you've taught Jabari," she said. "Look, he has not played well over the last couple of weeks," Krzyzewski said. "And since my brother's death I haven't coached well. I can't explain it to you exactly. It's not an easy thing. It's my only brother." He hesitated. "We support you, Mike," Lola said. "I've never gone through anything like this," Krzyzewski continued. "But I can tell you my brother would not want me to use him as an excuse for me not doing what I'm supposed to do. The past couple of weeks I didn't do the corrective things that I normally do when a player of his caliber plays as badly as he has. But I'm on top of it now. We are O.K." "We want you to be hard on him," she said. "I will be," he said. Despite staying up all night watching film, Krzyzewski had a smile on his clean-shaven face and a zip in his stride when he entered his office at 2 p.m. Wearing a blue-and-white sweatsuit he sat in a leather chair and reviewed Parker's statistics from the previous night's game, an 83-63 blowout of Wake Forest that lifted the No. 11 Devils to 18-5: 21 points, eight rebounds, two blocks, two steals. "It was his best game," Krzyzewski said. "Not his most dynamic performance, but his most efficient one. He played amazing defense. And he never got tired." Earlier in the week Krzyzewski had his players listen to an interview in which Kevin Durant said the most important thing he's learned as a pro is the importance of doing the simple things well. The message got through to Parker. "Last night Jabari went to the right spots on the floor," Krzyzewski said. "Instead of meandering around, he moved with a purpose. Instead of standing, he was in a stance. And he was fully immersed in the game mentally. Those are the simple things." Of course, the better Parker does those things, the more likely he is to leave Duke sooner. "I recruited him knowing that we would lose him," Krzyzewski said. "But I want him to have the foundation when he leaves. He is now at the level where he can go to another level." If Parker does declare for the NBA in April, it will be hard on both of them. "Coach K and I have a great friendship," Parker says. "We have a father-son relationship. I love the man. And I've put my complete trust in him." Even though he had minimized the distance between Chicago and Durham, Sonny had not been up to traveling. Last week, in his first trip to Durham with Lola, Sonny sat two rows behind Duke's bench. "Your son doesn't look like a college player anymore," a friend said to Sonny during warmups. "Now he looks like an NBA player." "He came to the right school," Sonny replied. Jabari rebounded Maryland's first miss of the game, drove the length of the floor and scored while drawing a foul. Sonny sprang to his feet and pumped his fists. He did this almost every time Jabari scored any of his game-high 23 points. With 1:21 left and the Blue Devils trailing 67-66, Jabari got the ball in front of Duke's bench. He faked a shot, jab-stepped to put his defender on his heels, blew past him with one dribble and leaped over a second defender for a monster dunk that sent the 9,314 Cameron Crazies -- Sonny and Lola included -- into a state of ecstatic delirium. After a 69-67 win that lifted Duke to 20-5, Sonny stood off to the side as a pack of journalists surrounded Jabari's locker, waiting to approach until the last reporter left. Jabari threw his arms around his father. Then Sonny stepped back and asked about that late-game dunk. "How many dribbles before you took it to him?" "You know how we do it." An hour later the Parkers were enjoying a quiet meal at TGI Friday's. The waiter had barely brought the entrées when a fan spotted Jabari and approached for a picture. "I'm sorry," Parker said, "but I'm eating with my family." The fan returned to his seat on the other side of the restaurant. During the meal Sonny reminded Jabari of how he used to dribble between cones on the sidewalk in front of their house when he was eight. The playgrounds weren't safe, so Jabari would do drills for hours under the watchful eyes of his parents. Neighbors would stare at him. "Someday these people will be asking you for tickets," Sonny used to tell him. As soon as they finished eating, Sonny turned to his son. "Now that we're done eating, go find that man who asked for the picture," he said. A moment later the fan was at the Parkers' table, getting his photo taken with the most-talked-about player in college basketball.